… as I knew it before the past two weeks. But much better. Much, much better now. By now you’re all probably aware (unless you haven’t been to the Spraground) that I’m out of the apprentice program. I won’t say much about it except that I believe everything happens for a good reason, and when you do your best and still what you worked on slips through your fingers, it can only mean that there’s an even better opportunity out there, waiting in the wings. I’ve gotten so much more than I ever could’ve had I gone farther than the second week. And what I have received is worth infinitely more than anything in the world. I have been overwhelmed again and again by the overflowing love, affection, loyalty, and support of my sistahs on my playground… and when you have that, how can you not feel that you have won so much more? I do. I have treasures beyond compare, and they have names. I play with them everyday on the playground. They are my friends. They are my family. I may not have had the opportunity (yet) to hug them in person… but they know that I’ve sent a kajillion hugs over the oceans and clouds, a kajillion hugs for each one of them. I am so blessed. So happy. So contented. And THIS, this is the life I have wanted. I went on this adventure and learned a lot. But my most important gains were not in the area of design. They were in the book called Life. I have never, ever waivered in my devotion to my home-away-from-home aka Spraground. And I was not happy being away from my friends there, which was what happened while I was working on my entry kits. And really, if you have the Spraground sistahs in your corner, how can anything go wrong? How can anyone be sad? The only tears I’ve shed are those that have quietly rolled down my cheeks as I’ve read messages of love, support, and affection from the girlies (and guy-ie :D) who mean the world to me. Beautiful quote. Beautiful email. Beautiful person. And beautiful messages and beautiful cards from beautiful people! (And I mean beauty of the heart!) ~ God is so good. He has blessed me with so many gifts. You. My friends. Precious, precious gifts. So now I’m back, and I’m extremely glad to be right where I belong, surrounded by all your beautiful hearts. Ahhh. Always so good to be back home. I promised the paper I used for the preview of the ElementaLove kit, but I didn’t want to give just one piece, so I created more stuff… My creative muse is still in that experimental mode, so I have a torn and curled rough paper border, four grungy & textured papers (three solids and one patterned), a grungy photomask (pull in your photo onto the layer above it, hover your mouse on the dividing line between the photo layer and the mask layer till you see a snowman-looking icon, then click and you have your clipping mask! 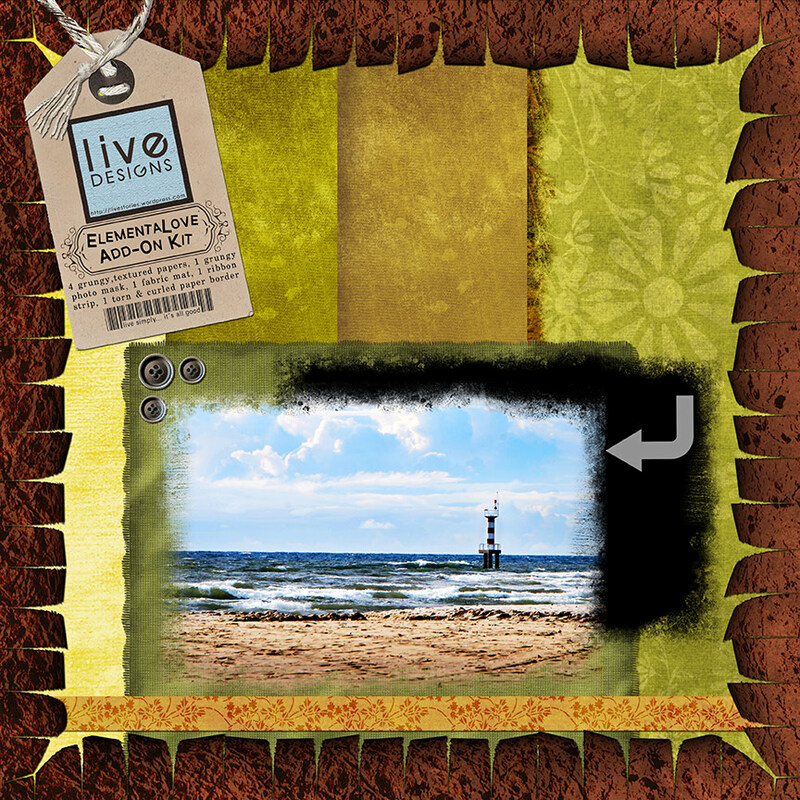 ), a fabric mat with built-in buttons to attach it to your layout (can be used for journaling or as a photo mat), and a simple ribbon strip. And here’s where you can snag the ElementaLove Add-on Kit! Okay, I’ve got to do some rounds on the galleries to leave love, because I’ve been away for so long and I am just soooo excited to see all the masterpieces my friends at the Spraground have come up with!!! Categories digital scrapbooking, goodies & freebies, Management, random thoughts, scrap bites, Share the Digi Love! Liv – I am just starting out in Digi – taking JS – Up and Running now. Found your site and LOVE your work. I can’t believe that you give all of this away. Thanks for the tip on collecting credits – that will be a great help for me just starting out. Liv, thanks so much! Love your new kit! You are a total inspiration & such a good person! So glad to have “met” you!! liv – you are a total inspiration in SO many ways . . . whether we’re talking talent, imagination, creativity, generosity, wisdom beyond your years (i could go on! ), i never cease to be amazed that your supply seems endless! so sorry about the apprentice program, but as your friend said, god is apparently building you a waaaaaaaaay better house! Yes, I was totally honored by the scraplift! I never even knew about the Spraground before this, and only a passing comment by Anke clued me in to why I was getting such late comments on that layout. So, thank you! I would have written private e-mail, but don’t have yours. I’ve been interested in digital design about 2 months. I made a mini-kit for the Little Dreamer apprentice program too, I didn’t make it to the 1st round-but when I saw your entry, I thought to myself, “Whoa, I didn’t stand a chance!” Like you, it was a good experience. It helped me to take that first step. You have a great attitude. Can’t wait to see what you’re up to next. Great things are in store for you and your gorgeous designs. good to see you feeling peaceful liv!! thanks for the wonderful creation! I love the photo mask! Did i ask for this too? you know i luv ya gf! have a great trip! Your talent still amazes me!! We think you are awesome..don’t you just love CS Lewis. Glad you are all feeling better! Love your latest creations, Liv! Thanks for sharing your talent with us! Liv, you are unbelievably talented and GENEROUS! You are not only creative in the design department but the way you are with words! Thank you for the great paper and everything else you give away!!!! I am glad you had the opportunity to spread your wings a little with LDD–and I’m glad your back on the playground more. As they say “there’s no place like home.” Welcome home GF–love and big hugs. Love it love it love it! I’m snagging it right away! Thank you so much. You are so right about LDD. On to bigger and better things!